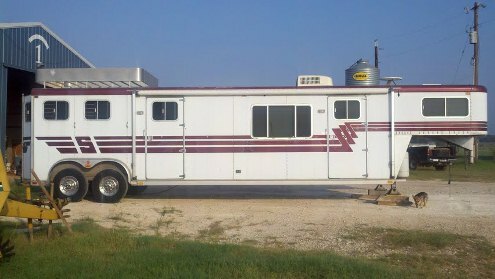 1994 Sooner Aluminum Living Quarters 2 or 3 Horse Trailer with Generator. "34ft 4in Long 7ft 9.25” wide Fenders make it 8ft 4in Wide (Hwy Legal) Gross Vehicle Weight 9,400 #s the weight at the Fifth Wheel is 3,400 #s I have Weight Certificate. 7ft Interior Height. Overall Height with Hay Rack is 10ft 3” Hay rack is 8ft x 7ft, Roof is solid one piece, With 3 Roof vents, No leaks. 2 Drop down windows for horses. Sliding Bus Windows at Rump. All Rivet Construction, Not spot welded. In the Horse area the Walls and ceiling are insulated and covered with aluminum then rubber mats on the walls at the kick areas. Removable Rubber Mats on Newer Aluminum floor. Built in Feeders as shown. 7000 Pound Torsion Axels with New Brakes and 98% Tires. Two Speed Electric Jacks for raising and lowering. Built in Onan 4.K Propane Generator, Roof-mount Duo-Therm 15,000 BTU A.C. with Heat strip. Air and heat are ducted thru ceiling and includes horse area. Monitor Panel has remote start for Generator. Magnetec Converter with Battery Charger. 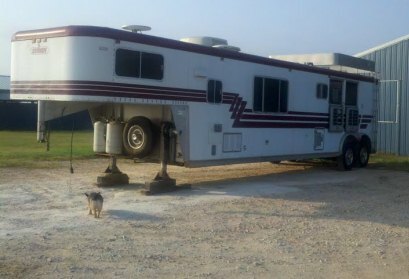 21ft Living Quarters including King size Bed. 14ft 6” on the floor, No short wall. Dark Tinted Windows. Shower 6ft 4in Tall, Large Grey and Black Water Holding Tanks recessed up inside the frame for protection. Toilet separate from shower, Large Fresh Water Tank. It is full length of couch. Monitor panel for tank levels. New 8 Cubic ft Refrigerator with Freezer, Microwave/Convection Oven, Forced Air Furnace. Couch makes into Bed. Movable Barrel Chairs. Hinged Drop Down Table. In addition it has a three piece, removable floor to ceiling Aluminum Divider, that can be put in place of the removable Tack Room to transport a Harley Road King, along with Two Horses Comfortably. 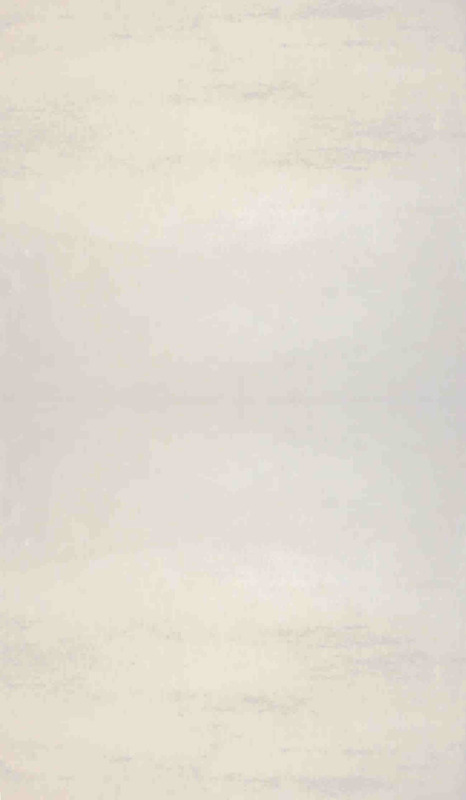 Ø Has small dent/scrape where horse kicked it a glancing blow by Generator Door.